It isn’t just enough to have the right tools for bushcraft, looking after them is extremely important too. At times an axe can be more valuable than a knife, so it’s worth caring for it correctly. You can easily protect your axe by oiling it after each use and making sure that you never put it away when it is wet. Here are our simple tips for caring for your axe. Some good quality axes have heads made of non-stainless steel. If the head gets wet and is allowed to stay damp for a while, it can quite easily rust and shorten the life of the axe. So it is best to avoid using soap and water to clean the axe, especially as this can also remove much of the oils and wax that you will be using to protect it. Sometimes bits of residue from chopped wood will be left on the bit of the axe and can be tricky to remove. So to clean it, all you need to do is take a knife and scrape off the debris. Cleaning the head can be done with a good coat of Vaseline rubbed in then wiped off. This helps to remove the dirt without damaging the axe. You can protect the axe head by using oil. Any oil will do. Gun oils are good for creating a dry finish on the axe head. Apply a thin layer of oil all over the metal of the axe head and then remove any excess with a cloth. Allow the oil to dry off as much as possible. Most traditional-style axes are made of wood. To preserve and maintain the finish of the handle, you can apply a coat of boiled linseed oil now and again. Before using the oil, make sure the handle is clean, then apply boiled linseed oil to the handle with a rag or a small paint brush. Make sure you coat the top and bottom of the handle as this is often where water can get in. Once the handle has been completely coated in the oil, take a cloth and remove the excess and leave the handle to dry. This process will provide a layer of protection to the axe. As you continue to add layers, you will build up a good, resilient layer of finish on the handle. The handle will eventually darken over time, but that isn’t a problem and won’t affect the axe’s use. To remove the dark colouring you can give it a light sanding, but make sure you oil and wax the handle afterwards. Like with the head, you need to keep the handle away from moisture. If the handle is allowed to be wet then it will start to rot. But you also must make sure that the handle doesn’t dry out either, as this will cause the handle to shrink and could cause the head to become loose. Your axe should be stored in a cool, dry place. Between 5 and 20 °C or 40-70 °F) is ideal. Not storing your axe properly or allowing your axe to get repeatedly wet, can cause the handle to loosen and result in the axe becoming unsafe. If you take the time to properly look after your axe, then it will continue to stay in great condition and you will be able to enjoy many years’ worth of use from it. To really get to grips with using your bushcraft axe, join our bushcraft axe skills and charcoal making weekend course, ideal for anyone who wants to become skilled with using an axe. These days we tend to rely on using maps and technology to help us get around, but believe it or not, it is possible to find your way around without modern gizmos. It is a skill you can practice anywhere. A compass can help you test out your natural navigation skills and is a useful back-up if you do get lost. Just make sure that the big red arrow is always pointing north. By using a long stick, you can find your direction using the shadow cast from the sun. Place a straight stick about one metre long into the ground. The sun will now cast the shadow of the stick. Mark the end of the shadow and this becomes your west point. Wait 15 to 30 minutes and as the earth rotates around the sun, the shadow will move. Mark the shadow again and this will become your east point. You will now have your east-west line. If you stand on your east-west line with west on your left and east on your right, you are looking north. Where trees tend to grow upwards towards the sunny south, moss prefers the cold damp north. Find a lone tree out in the open. It is generally thought that the side of the tree with the most growth indicates south. The north side will have less growth and what growth is there will be pushing upwards towards the sun. You will be able to find your north-south line and once you know that you can then work out the east-west line. The more trees you find leaning towards the sun and the more moss patches hidden in the shade of the tree, the more chance you will have of finding a good indicator of north and south. For this method, you need an analogue watch, which will act as a compass. If you are in the northern hemisphere, lay the watch flat and face up in your palm, making sure the face is parallel with the ground. Point the hour hand in the direction of the sun. It does not matter what the time is as long as it is accurate. Now all you need to do is divide the angle between the 12 o’clock mark and the hour hand. This will give you the south-north line. In the southern hemisphere, you will need to point the 12 o’clock mark at the sun rather than the hour hand. This will give you a north-south line. For this method, all you need is a clear night sky and to be able to identify the Plough. The Plough, also known as the Big Dipper, consists of seven stars and looks like a large pan. It is part of the Ursa Major (Great Bear) constellation. Once you have identified the Plough, locate the last two stars that form the pan section (furthest away from the ‘handle’) and follow them upwards in a straight line by four times their own distance and you will have found the Polaris, or the North Star. The star sits directly over the North Pole, so if you walk towards it, then you are heading north. This method only works with a crescent moon. Draw a straight line down from the top part of the crescent to the bottom point and follow that line to the horizon. Where you meet the horizon is south. You can check whether you have got these methods right by using a compass, or the compass app on your phone. Once you have developed good navigation skills, you can confidently roam freely whilst enjoying the great outdoors. Come and join us for an adventure out in the woods on our of our bushcraft courses. Visit our courses page for more details or get in touch. As a rule knives and children don’t mix. 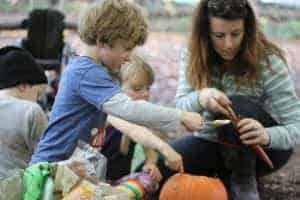 But a knife is an important tool for bushcraft, so it is good to get children understanding the importance of how to handle a knife properly and safely from an early age. If you are going to let your child use a knife for bushcraft, then they must be old enough to understand the responsibility that comes with handling a knife. They must know how to use it safely and be prepared to follow the instructions and ‘rules’ they are given. A knife is not a toy or an accessory, but a key bushcraft tool. If children are well supervised and taught about knife safety, then there shouldn’t be many problems. The knife should be well-made and robust. The handle should not be slippery but have a good grip and be well secured around the blade. The sheath must be strong and hold the knife securely. The best knife for practicing bushcraft is a simple fixed-blade knife with a sheath. This type of knife can be used for a range of different tasks and allow the user to make effective and controlled cuts. The knife should fit the size of their hand and the blade shouldn’t be any longer than the width of their palm, so they have good control over it. Spend time explaining the serious responsibility of handling a knife. Being able to handle and use a knife properly takes patience, dedication, and maturity. Give them clear instructions of what is acceptable and safe behaviour for using a knife. They must understand the dangers and how they can protect themselves from injury and know what to do if something happens. They should have their own first aid kit and know how to use it. A basic understanding of first aid and being able to treat a cut is essential. Always set a good example in front of your child. This includes not taking any risks, always use the right knife for the right job and always have your first aid kit with you. Teach them to be aware of their hands when cutting towards themselves or their gripping hand and not to move around when holding a knife. They must know never to point a knife at someone. If they need to pass a knife to someone else, teach them to do safely, by offering the other person the handle and keep all fingers away from the blade. They must always be focused when using the knife. If tired or distracted, put the knife away safely for another time. Anyone using a knife, whatever their age, needs to understand the law on carrying knives and where they can use one. Encourage children to practice carving for short periods, to help them get used to handling the knife and to avoid blistering. You can get them started with a simple and practical task like making pegs. Knife safety is one of many skills we teach on our Family Bushcraft Course. All the family can learn some great practical bushcraft skills which they can use when they are out in the woods. Get in touch to find out more. Fire is a key component in bushcraft and survival. It keeps you warm, provides light and you can cook your food over it. But a campfire is also a great way of getting people together and enjoying each other’s company without ‘modern’ distractions. With a little preparation, lighting a fire is simple. While the actual fire lighting should be left to an adult, children can enjoy helping to gather all the materials. Children always enjoying building a den. Working together and using a little imagination, you can together create a lovely natural shelter that will keep you warm and dry. You don’t even need to venture out into the woods to do this. You can always build a shelter in your back garden. Once built, where better to play games, eat a meal and just enjoy being outside. It is simply amazing what delicious things you can find to eat outdoors. Foraging is a great activity for all the family and can be extremely rewarding. By law, you are allowed to forage for fruit, flowers, foliage and fungi. You can do this anywhere, but you must have the right or permission to be on the land. One of the most important rules with foraging, is if you aren’t 100 per cent sure what it is, then DO NOT eat it. If in doubt, leave it out. Animal tracking uses footprints, trails, feathers, kills, scratching posts, drag marks, smells, and behaviour exhibited by other animals, to identify an animal. It’s a great way to learn more about the landscape and sharpen the senses. Have a go trying to track some deer, badgers, wild rabbits or even wild boar. You can practice this anywhere. Use the sun, a shadow stick, tree and moss growth or the watch method to help you. A compass is a great tool to help you experiment with natural navigation and easy to use. Just remember that the big red arrow always points north. There is something quite wonderful about spending time outdoors making something beautiful and practical that will last a long time. For children it is just as satisfying and carving a tent peg, is a great way to get them started with using a knife. As their confidence and skills grow, they can move on to making a pot hanger, spoon or even a cup. Children should of course only use sharp tools under supervision, and it is important that they understand how to use a knife safely before they get started. Knife law: Whatever bushcraft fun you have planned for the half term, it’s important that you know the law on carrying and using knives. Leave no trace: Once you have finished your activities it is essential that you leave no trace that you have ever been to that area. The key essence of Bushcraft is respecting the environment and other people that may also use that area. For more family bushcraft fun, sign up to our next Family Bushcraft course which the whole family can enjoy. 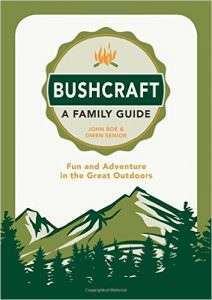 You can also get your hands on a copy of Bushcraft: A Family Guide, a fantastic resource full of ideas and guides on how to enjoy the great outdoors with your friends and family. Get your copy from Amazon and all good book shops. After the harshness of winter, spring provides a welcome change. Nature suddenly burst into life with lots of animal activity and plant growth, so there is no better time to be outside. If your bushcraft kit has been gathering dust over winter, get yourself back out into the woods. Enjoy the start of this new season, by practicing some basic bushcraft skills to get yourself ready for the year. Practice putting up a tent or tarp, see what plants and trees you can identify, test out your axe skills, or do some foraging. Flowers are in bloom and leaves are spreading. It is the perfect time to explore and gather some of nature’s bounty. Many wild edible spring plants have restorative properties and nutrients, often so welcomed after the sluggishness of winter. 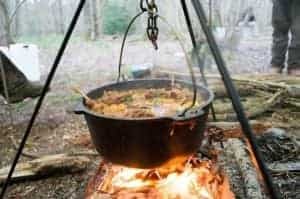 We teach about foraging on our Wildway Bushcraft courses and how to gather, prepare and cook the food you find. If you venture out in early spring time, you may find the pickings to be slim. But as the shoots start to appear, there are some spring greens you can collect. Be warned though, some early spring plants contain toxins. Snowdrops, daffodils and bluebells contain poisonous substances. It is important to make sure you can always positively identify any plant that you are planning to eat. If you are at all unsure, just leave it well alone – it’s not worth the risk. An important rule of foraging is to only take what you need. The area might be bursting with bounty, but you do not need to take it all. Be careful not to damage the rest of the plant or the surrounding area while you are gathering. These have heart-shaped and jagged leaves. The leaves and stems are covered with stinging hairs. The nettles can be found on waste ground and in woodland and are tasty and very nutritious. Using gloves, pick the top four to six leaves of the young plant up to around June. Cook them in boiling water, drain and squeeze well before chopping. They can be used similar to spinach in curries and stews. Try them in omelettes, risotto, pies and even on pizza. A pretty flower that can be used as an attractive garnish for salad. The flowers can be used raw, with the leaves fried in oil until crisp. These can be found pretty much everywhere. Wear gloves to avoid getting stained hands, as they contain a milky sap when they are cut. Dandelion leaves are quite bitter, and taste rather like chicory. Very young, spring leaves are less bitter. They can be used like salad leaves or spinach. You can even make tasty fritters with the flower buds, you just need to coat them in a light batter before frying. Before you prepare and cook anything you forage, make sure you check for bugs that may be hiding in plants and flowers. You can find out more about all things bushcraft by joining us on our bushcraft courses. We hope to see you out in the woods very soon. One of the most important skills of bushcraft, is to leave no trace that you have ever been to that area after you’ve left. Bushcraft is about respecting the environment and others that use the area. Leaving no trace is key to being a responsible bushcrafter. If you have a camp fire, you should make sure that the area is left safe, clean and as you would hope to find it.You need to make sure that the camp fire site is safe from fire before you leave. Make sure the fire is completely out and dead by thoroughly dousing the site with water. We recommend you choose a site that is quite close to water, or you take extra water with you. You will need quite a lot to ensure the ground is cooled down enough and safe to leave. If you choose to set up your fire at a site where there is already an established fire circle, you still should not leave it with inflammable rubbish and burned logs. Even if the site has not been tidied before you, you should make sure that all traces of your fire have gone. Along with clearing away all remnants of the fire, you must also take away everything you used in cooking, like packaging, foil and tin cans. Consider what type of fuel and how much you will need – it will primarily be used for cooking and keeping warm. How long will you be camping for? You may want to practice judging your fuel so there are only ashes left by the time you finish your camp. Will you be camping near a water source? You may choose to take water with you, but you need to make sure you pack enough and remember you will have to carry it to the site. Natural shelters should only be built using dead material, to avoiding making any impact to the local area. Before you leave, remove all of your shelter and take it away with you. Leaving a shelter up spoils the area and could also be dangerous for the local wildlife and future visitors. Using a tarp or a tent is a much better option. When you have finished, pack away all your rubbish and debris and dispose of it away from the site. As you leave the site for the last time, look back and give the whole area another look around. It’s always worth checking a final time to make sure you haven’t left anything. Bushcraft is all about respecting the environment and wildlife, while enjoying the great outdoors. If you join us on one of our Wildway Bushcraft courses, we will show you how it is possible to enjoy bushcraft without impacting on the local environment. To find out more about us and our courses, just get in touch.